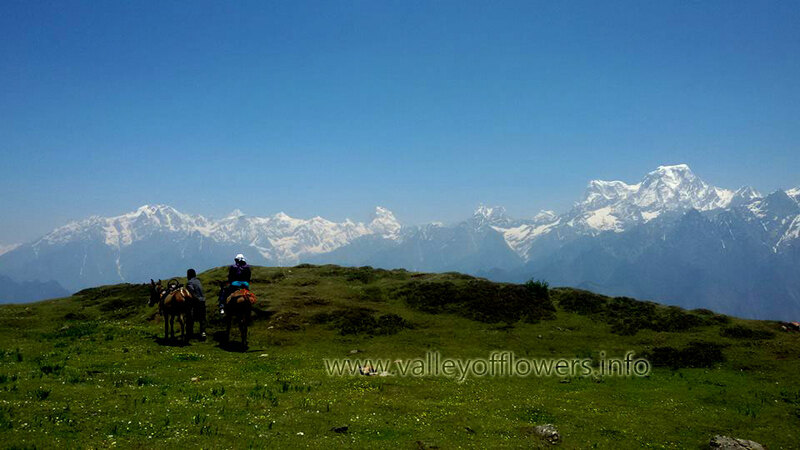 Whether Auli should be part of Valley of Flowers tour ? Auli is only 14 km from Joshimath. Just by adding in your itinerary you can visit Auli and trek to Gorson Bhugyal. The Gorson Bhugyal (alpine meadows) is very beautiful place and a must visit. We have been taking our customers to Auli along with Valley of Flowers since 2014. 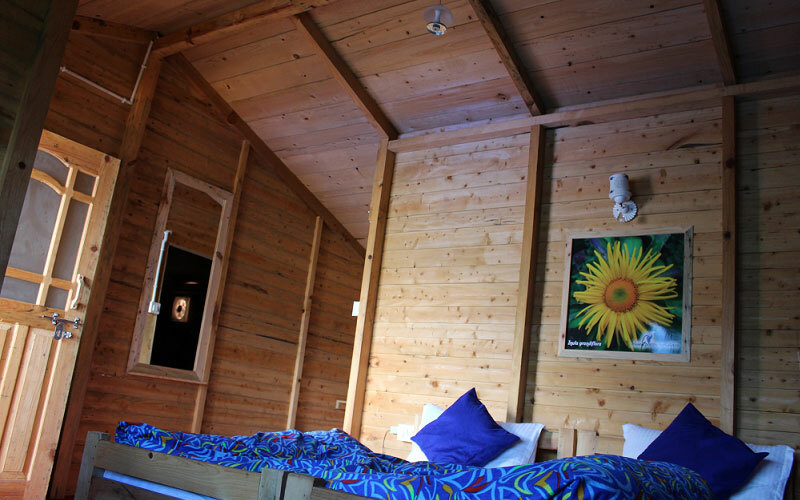 All our customers liked the idea of adding Auli into the itinerary. Please check following link to see TripAdvisor reviews for Gorson Bhugyal..
What is the cost of hiring Helicopter, pony, porter, palanquin etc ? Helicopter is available between Govindghat and Ghangaria. Cost per person for Helicopter is approximately Rs 3000 per person per side. It varies every year. In 2017, it was Rs 3240. Cost of hiring pony, porter, palanquin etc is highly volatile. It depends upon demand and supply but porter take Rs 2500 to Rs 4000 per day depending upon the weight. Since four people carrying a palanquin it is little costly and cost varies between Rs 6000 to Rs 12000 per day. Pony cost Rs 600 to Rs 1200. But during June month these costs may go as high as 200% because of the high pilgrim season. Does rain spoil trip to Valley of Flowers ? 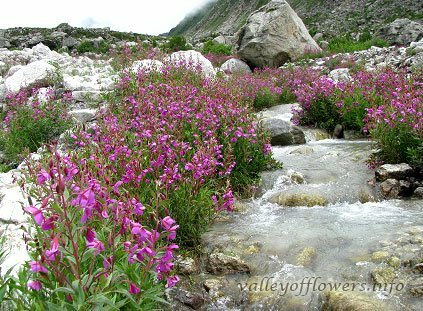 Valley of Flowers is in full bloom during July and August. This is also the monsoon period. Many people are worried about landslides. But fortunately the road condition between Haridwar and Govindghat has improved a lot. One may have to wait for few hours to get the landslides clear by the Border Road Organization. In rare case, if the landslide are too much then one may have to extend the trip. But this is very rare. 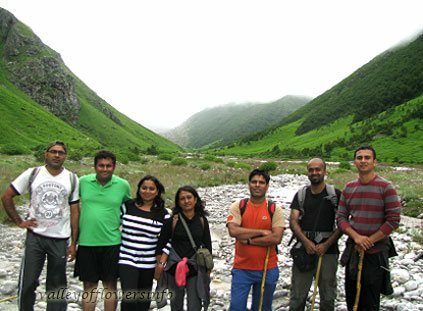 People coming to Valley of Flowers normally go to Badrinath also. Between Govindghat and Badrinath there is a place called Lambagad. It rains almost daily in the evening at this place and authority normally clears it next morning. One should go to Badrinath and come back before 3 pm, sooner is better. In Valley of Flowers and Ghangaria it normally rains during night time. Whatever, is written here is our experience and we dont claim it to be right 100 % always. 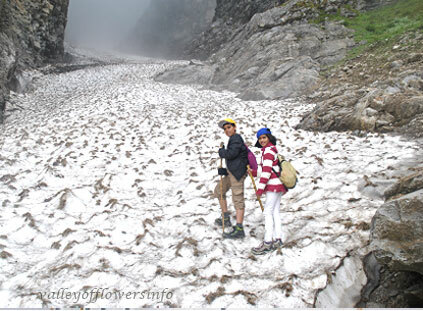 How much you need to trek for Valley of Flowers tour ? 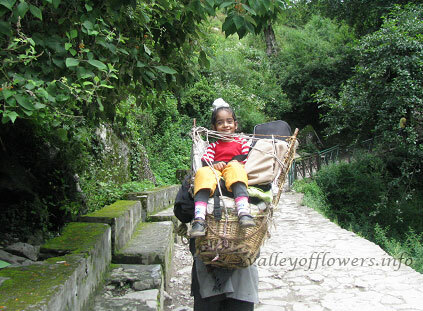 What are the things to carry for Valley of Flowers ? The following is what we recommend you take, and is a guideline of what to bring. You are responsible for having the necessary personal equipment you need for this trek. Read more…..
How to prepare for Valley of Flowers tour ? You need to prepare yourself in terms of stamina and you need to carry things on your trip. These things are to be bought well in advance. Please check the following links. 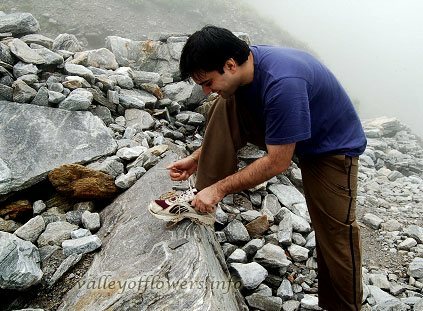 Prepration for Valley of Flowers trek. and Things to carry for Valley of Flowers trek.. Apart from this you should consult your doctor before coming to this trip. As you will be trekking to altitudes above 14000 feet. What is the opening and closing timing of Valley of Flowers ? 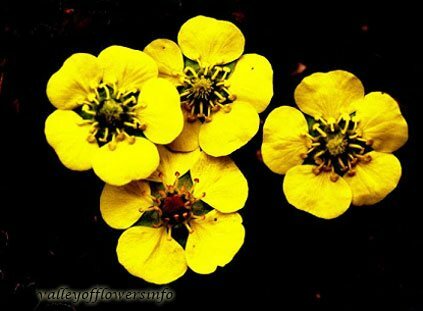 What is the opening and closing date of Valley of Flowers ? 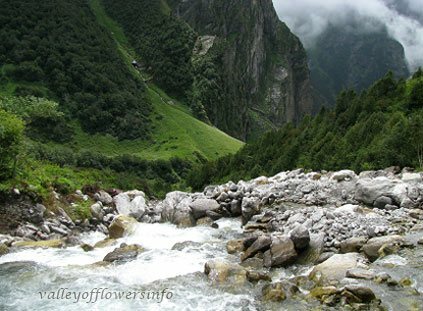 Valley of Flowers opens on 1st June every year and closes on 4th October. However, forest department can change these dates. It is seen in past and Valley of Flowers opened till 10th October. 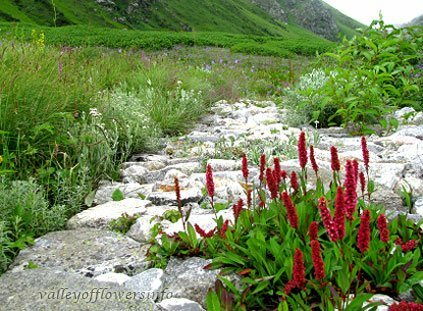 Normally opening and closing date of Valley of Flowers is same as Hemkund sahib. 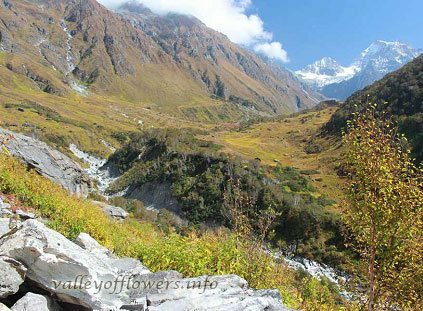 How difficult is Valley of Flowers trek ? What is the minimum age to visit Valley of Flowers ? 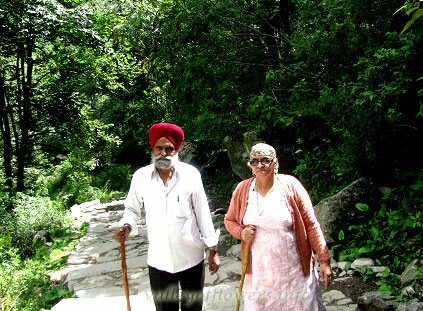 Can senior citizen visit Valley of Flowers ? How many days are required for Valley of Flowers tour ? What is the best time to visit Valley of Flowers ? 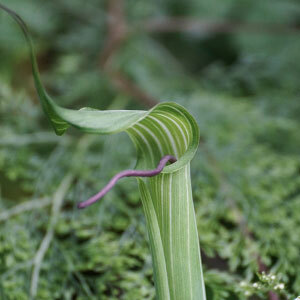 Arisaema jaquemontii is a tuberous herb. Leaflets 5-7 per leaf. Leaves are tail like at apex, cuneate at base and wavy along margins. Spathe is 12-15cm long. Berries are red when ripe.